"Why, of all the multitudinous groups of people in this country, do you have to single out Negroes and give them separate treatment?" Thurgood Marshall reproached the Supreme Court with this and other questions in the landmark civil rights case Brown v. Topeka Board of Education. In this 1954 case attacking U.S. school segregation policy, Marshall and a team of lawyers and sociologists proved that "separate" education facilities for black and white children could never be "equal." This was the most famous of the many civil rights cases argued by Thurgood Marshall before the Supreme Court. 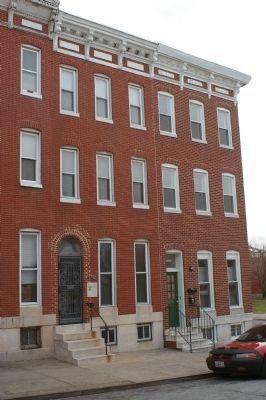 Born and raised in Baltimore, Marshall lived in this house as a young boy. Denied admission to the University of Maryland Law School because of his race, he commuted to Howard University instead, graduating in 1933. Two years later, he took U.M.L.S. to court on behalf of Donald Murray. He won the case, forcing the school to admit Murray, its first black student since the 1890's. Marker is to the right of the door. Note the extensive, historically inaccurate brickwork that had been done around the door, most notably the half-circle arch, instead of the arc, as is present on the next door over. in 1961. Four years later, President Lyndon B. Johns named him Solicitor-General, responsible for deciding which cases the Supreme Court will hear. In 1967, Thurgood Marshall became the first black to sit on the Supreme Court. Erected by the City of Baltimore, Baltimore City Chapter of the NAACP, Sponsor and William Donald Schaefer, Mayor. Marker series. This marker is included in the Maryland, Baltimore City historical markers marker series. Location. 39° 18.25′ N, 76° 38.009′ W. Marker is in Baltimore, Maryland. Marker is on Division Street, on the left when traveling north. Touch for map. Marker is at or near this postal address: 1632 Division Street, Baltimore MD 21217, United States of America. Touch for directions. 3. 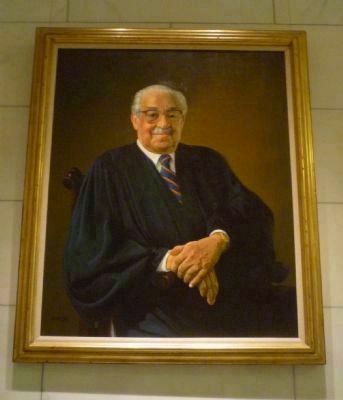 "Thurgood Marshall, Associate Justice: October 2, 1967 to October 1, 1991"
- official portrait by Simmie L. Knox, displayed at the U.S. Supreme Court Building in Washington, DC. (about 600 feet away); J. Howard Payne (1887-1960) House (approx. 0.2 miles away); The Elks Lodge (approx. 0.2 miles away). Touch for a list and map of all markers in Baltimore. First victory in the school segregation fight came in 1935 when Charlie Houston (left) and Thurgood Marshall (right) got Donald Murray into the University of Maryland Law School. 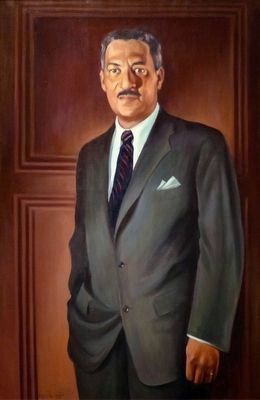 This 1956 portrait of Thurgood Marshall by Betsy Graves Reyneau hangs in the National Portrait Gallery in Washington, DC. More. 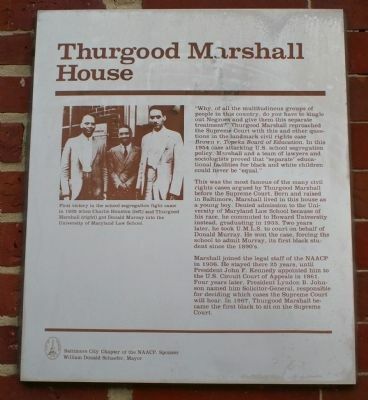 Search the internet for Thurgood Marshall House. Credits. This page was last revised on June 16, 2016. This page originally submitted on March 15, 2008, by Christopher Busta-Peck of Shaker Heights, Ohio. This page has been viewed 4,074 times since then and 51 times this year. Last updated on March 26, 2008, by Richard E. Miller of Oxon Hill, Maryland. Photos: 1, 2. submitted on March 15, 2008, by Christopher Busta-Peck of Shaker Heights, Ohio. 3. submitted on January 5, 2011, by Richard E. Miller of Oxon Hill, Maryland. 4. submitted on September 1, 2015, by Allen C. Browne of Silver Spring, Maryland.